Apple will launch AC Wellness, an employee wellness clinic and primary care group that will begin with two Santa Clara County, CA locations. I assume this was the end result of the rumor from last fall that Apple was talking about acquiring venture-backed Crossover Health, which runs Apple’s on-site medical clinic. Open position postings call for “experience across EHRs,” which fits with the hint that the clinics will be run by “a dedicated independent medical group” that sounds like more of a network than an Apple-employed provider group. Nobody has mentioned Crossover Health in the context of this latest news. From Your Epic Host: “Re: Epic’s hosting volume. No way its several new March go-lives will increase the number of live hosted systems 4-5 times as the reader’s rumor reported. Concurrent users will increase by barely over single digits. Don’t ask me how I know, but I know. Epic will have no problem with all the new live hospitals.” Unverified, but the source is solid. From Pliable: “Re: the study saying that it costs $215 to bill and collect for an inpatient surgical procedure. That seems low, especially if independent surgeons, radiologists, and anesthesiologists send out claims to a primary and secondary insurance carrier (that’s eight claims in total). Did the study include cost of AR management and pended / rejected claims processing?” I can’t say since the full article lives behind JAMA’s paywall. I’m getting increasingly annoyed that research – much of it paid for with taxpayer money – is inaccessible to those unwilling or unable to pay several hundred dollars per year to be mailed dead-tree magazines that take forever to publish submitted articles. Are publishers really adding that much value to the research process to justify their high margins and restrictive copyright practices that don’t allow authors to post their research findings elsewhere? From HIMSS Stalker: “Re: HIMSS meeting requests. HIStalk should run a competition of who has the most meeting requests from the same vendor, showing the previous requests forwarded so you can see how shameless these people are.” We’re pretty close to the wire for starting a contest, but I’m interested – who has received the most HIMSS18 meeting requests from a single vendor? The other thing that puzzles me the “HIMSS18 Conference Deals” that HIMSS keeps emailing me, which they launched years ago as yet another way to spam me about high-paying event sponsors way back when Groupon was considered cool. My problem is that there’s no actual deal, just a pitch to visit some vendor’s booth for a demo or “free consulting session” that fails miserably to answer the “what’s in it for me” question. “I should have done it SOONER!” is the most recent response to What I Wish I’d Known Before I Quit My Job to Go to Work for Myself. That is, until you add your thoughts. Welcome to new HIStalk Platinum Sponsor IMAT Solutions. The Orem, UT-based company provides a flexible data management solution for hospitals, HIEs, and ACOs that was designed upfront to ingest thousands of data sources – including unstructured data such as physician and visit notes – in seconds, providing a solution that’s easy on the budget, compatible with existing software, and usable by non-technical clinicians who need to see a 360-degree view of every patient. Clients use it to analyze hospital and clinic population data to find disparities in care, conduct clinical documentation quality reviews, identify at-risk patients who are drifting towards critical, and reduce admissions. 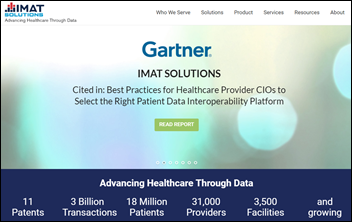 IMAT’s consolidated patient record and reporting interface provides an integrated view of data from multiple sources (HIE, PACS, lab, EHR), its EMPI performs record-patient matching, and its validation and normalization rules are applied to incoming data for accurate quality and population health reporting. Specific solutions address Meaningful Use reporting, population health management, and medical research. Drop by HIMSS18 Booth #11418 to get a peek under the hood or hunt and gather from their downloadable resources page. Thanks to IMAT Solutions for supporting HIStalk. R1 acquires revenue cycle, healthcare analytics, and emergency preparedness technology vendor Intermedix for $460 million. CNBC reports that Alphabet-owned Verily – the former Google Life Sciences – is talking to insurers about participating in at-risk population health management contracts. 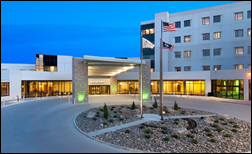 Lancaster General Hospital (PA) chooses Mobile Heartbeat’s MH-CURE for smartphone-based clinical communications and collaboration. Ascension expands its revenue cycle agreement with R1 to cover its medical group. 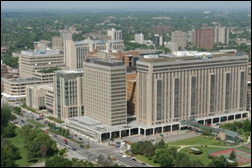 BJC HealthCare launches a Perficient-powered cloud-based enterprise data warehouse. Will Weider is named SVP/CIO at PeaceHealth (WA), where he was serving as interim. 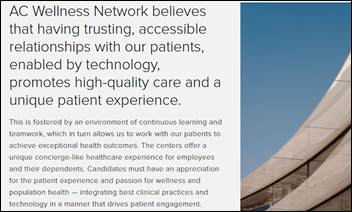 Huntington Hospital (CA) hires Scott Groom (Bassett Healthcare Network) as SVP/CIO. He is a rarity in apparently having left no photographic evidence of his existence anywhere on the Internet that I can use here, so we’ll just have to picture him our minds. Meditech renames its Web EHR to Expanse. 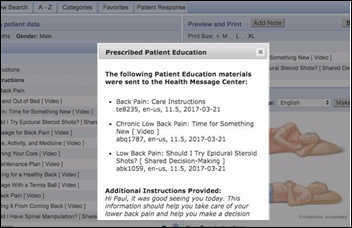 Healthwise publishes its patient education app on Epic’s App Orchard, with the app and its supporting API allowing health systems to integrate patient education content into Epic’s EHR and patient portal. 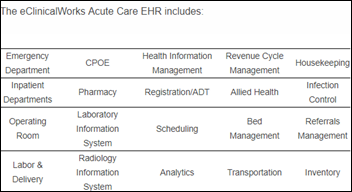 EClinicalWorks launches a cloud-based hospital EHR/RCM system that will start at $599 per bed per month with no upfront capital cost. The first live hospital will be 42-bed Hamilton Healthcare System (TX). That’s a pretty big deal given the lack of competition in the full hospital systems market as ECW and Athenahealth take their first steps into it. Document Storage Systems (DSS) launches Juno EHR for acute care and behavioral health, which I assume (since the company didn’t actually say) is based on the VA’s VistA, as is its VxVistA product. Change Healthcare announces InterQual AutoReview, which automates the medical review process by extracting clinical data directly from the EHR that produces and submits a medical necessity review, then reports the result back to the EHR. Wolters Kluwer Health launches UpToDate Advanced, a guided clinical decision-making solution. CMS says that as of March 3, teaching physicians no longer need to re-enter the patient information that was entered by medical students under their own name to get paid. In Western Australia (which is apparently has healthcare problems similar to ours), a government-commissioned health report finds that WA Health has spent a lot of money on IT projects in questionable areas and with little benefit to patients. It broadly notes that Western Australia’s overall health budget has doubled in the past decade to now consume 30 percent of the total budget but hasn’t correspondingly improved health outcomes since “the system focus remains on treatments rather than keeping people healthy” and embraces a provider-focused health approach. It recommends that the government address lifestyle choices, implement a navigator service to connect people with the right parts of the health system, run telehealth pilot projects, redesign mental health care around patients rather than by service provider, and improve patient-level data sharing among public and private providers. UCSF launches the My BP Lab app, jointly developed with Samsung for its just-announced Galaxy S9 and S9+ smartphones. It uses the phone’s built-in optical sensor and thus does not require an external blood pressure cuff. Users will be invited to join a UCSF study that will look at blood pressure and stress levels through the day. The New York Times describes the concept of “digital phenotyping,” in which companies analyze a person’s social media posting patterns or phone usage in trying to detect mental health issues, although concerns about efficacy and privacy remain unaddressed. Campbell County Health (WY) will lose up to $200,000 in Medicaid payments due to sending out delayed bills following its acquisition of a private surgery center. The hospital’s billing system was unable to handle billing as a hospital-based surgery center for more than a year after the hotly debated acquisition, requiring the surgery center to bill manually. A JAMA op-ed piece questions whether high-IQ medical students make the best doctors, also noting that medical schools overemphasize MCAT scores and science grades that don’t correlate to intelligence anyway. The authors say it’s equally important for physicians and healthcare leaders to have high emotional intelligence (EQ) that allows them to work with others in leading teams, coordinating care, and motivating behavior changes. They postulate that team-based care of chronically ill and terminal patients has failed because participants have low EQs. The article suggests that medical school admission committees add an EQ test component to the MCAT and stop obsessing over pre-med science scores and require training in psychology and leadership. 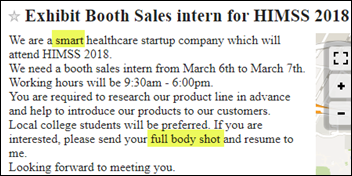 I don’t know how “smart” this healthcare startup is in advertising on Craigslist for a “booth sales intern” for HIMSS18 in which candidates must send a “full body shot” to the unknown Craigslist advertiser. Somehow I don’t think two days working on the HIMSS exhibit floor is much of an internship, nor does it seem necessary to examine the full bodies of “local college students” to vet them as acceptable booth help. The healthcare industry has seen a significant shift in how it creates, shares, and uses information. 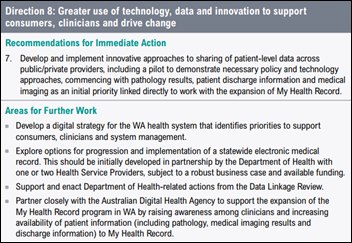 The key is to empower the complete exchange of clinical data and the ability to use it. As the industry unites in the pursuit of integrated, actionable data, Medicity is uniquely qualified to lead the next generation of interoperability. We collect patient data from any and all connected external sources. 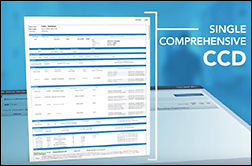 With just one click, providers can access a single, de-duplicated, comprehensive Continuity of Care Document (CCD). This clinical intelligence supports point-of-care decision making and gives providers more time to spend treating patients. See our video on Medicity Community Interchange or visit us at Booth # 2449 at HIMSS18. Optimum Healthcare IT matches the $5,000 raised by its client Southcoast Health for those affected by Hurricane Harvey, allowing a $10,000 donation to the American Red Cross. Mental Health Center of Denver adopts the Carequality interoperability framework via its Netsmart EHR. Frost & Sullivan recognizes Fortified Health Security with its Healthcare IoT Cybersecurity Company of the Year Award. AdvancedMD and ChartLogic will exhibit at the American Academy of Orthopedic Surgeons conference March 6-10 in New Orleans. IDC names Arcadia Healthcare Solutions a leader in US healthcare clinical and financial analytic BPO services. 904 Magazine recognizes CSI Healthcare IT as a “Company with Heart” for the third consecutive year. 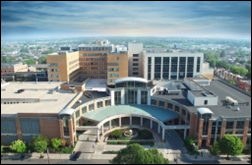 Santa Rosa Consulting assists Harrison Memorial Hospital (KY) with its migration from Meditech Magic to 6.1. Outcomes Rocket features Docent Health Senior Director Client Development Addison Hoover in a new podcast. Elsevier collaborates with the Beijing University of Chinese Medicine to enable deeper research into traditional Chinese medicine. EClinicalWorks will exhibit at the California Primary Care Association 2018 Quality Care Conference March 1-2 in Sacramento. Healthgrades publishes its annual list of America’s best hospitals. (1) These wellness ventures strike me as little more than internalization of the wellness programs bundled in with insurance products that work very poorly today. (2) Per the article, they seem to be working with Stanford. If my goal was pop health/wellness, I wouldn’t take my advice from an academic medical center, particularly not one that’s currently trying to buy its way into the primary care market. The branding is interesting because it almost sounds more like part of Stanford’s strategy to put clinics on tech campuses (I believe they have a few in the works already). Would love to see details about the ability of the soon-to-be-released Galaxy S9/S9+ to perform BPs without a cuff, using it’s optical sensor. There’s nothing in the UCSF press release or on Samsung’s website. I found an article that says users just press their fingers to the sensor and it reads BP via “light signals” (https://beebom.com/samsung-galaxy-s9-optical-sensor-blood-pressure-research/) but I’d like to know a little more. FDA cracked down on several apps a few years ago that claimed to accurately measure BP using a phone’s camera. I assume since several fitness trackers offer that feature that the technology has been vetted as reasonably accurate. I don’t know how many Galaxy users will use the feature, but it’s an interesting idea. Pubmed has a few articles from the last several years using photoplethysmography (PPG) along with some other technology to detect BP, but it wasn’t incredibly accurate, between 2-10 off the gold standard BP cuff. The article doesn’t mention whether that’s what they’re using, but I guess that’s why it’s a research study and IMO not worthy of a press release implying it’s just about to be available.